"For the next few weeks, we are going to be learning about dinosaurs. Before we start I want to find out what schema you may already have about dinosaurs. Who would like to share?" As the students share, I write the ideas on a post it note of all the same color. I have to be very careful not to respond even if it is incorrect! So HARD!!! One of the students this year actually said, "Dinosaurs eat people" and there was no correction from any student! Many of the students had nothing to share this year so it will be a learning experience! Then we read books borrowed from the library all about dinosaurs. I also show the students how to log into Epic and find books that can be read to them along with the more difficult books that they need to look at the pictures and tell themselves a story! Epic is free for educators in US and Canada! Click to sign up for Epic. Then we add information we learned from the book(Epic) onto a different colored post it. We move misunderstandings away from the new learning and our schema as we discover it! I also love to read Dinosaur Emergent Reader during shared reading and guided reading to draw a distinction between fiction and non-fiction. 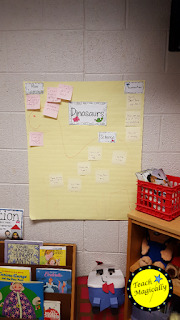 Check out my blog post about all the fun things we do with fiction and dinosaurs. I hope you've founds a few interesting ideas. Please share any other ideas in the comments.